This 40 S&W cartridge is from Hornady’s Critical Duty line of ammunition, the Nebraska manufacturer’s premier solution for full-size handgun carriers who demand superior barrier penetration without sacrificing knock-down terminal performance. The round’s 175 grain FlexLock projectile sports a patented Flex Tip polymer insert, which prevents clogging of its hollow point altogether and initiates rapid expansion during penetration. The FlexLock’s InterLock band keeps its tough high antimony lead core and notched jacket bound together during penetration, enabling optimal weight retention for a wide and deep wound channel. The FlexLock also sports a cannelure to prevent setback during feeding. This round has a low flash propellant, so your first shot won’t render you blinded if you must defend yourself in the dark. Its nickel plated brass casing not only facilitates a chamber check in a low light environment, but further increases its lubricity and ability to resist corrosion. Your repeat business is too important to us for you to utilize anything but the most effective personal protection ammo -- invest in Critical Duty! 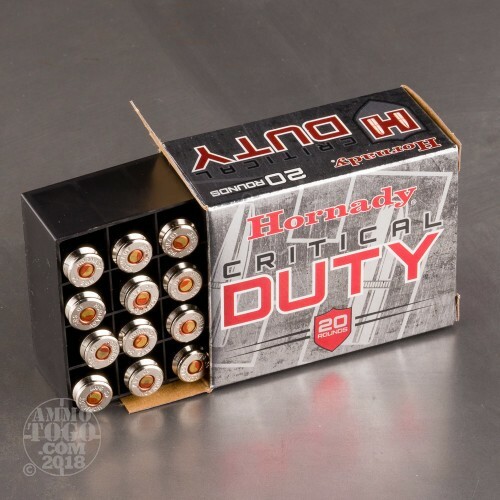 We shot five of these Hornady Ammunition rounds through a four-layer cloth barrier using a S&W M&P40c. The results are detailed in the video you see above as well as the photographs. 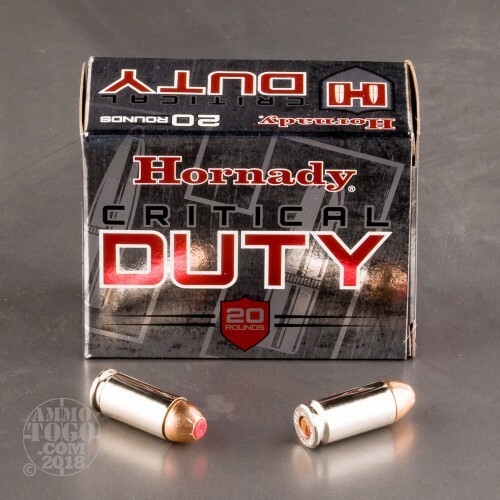 Through the charts, you should get a great idea how this Hornady Ammunition ammo stacked up relative to other 40 Smith & Wesson ammo products available to American shooters. 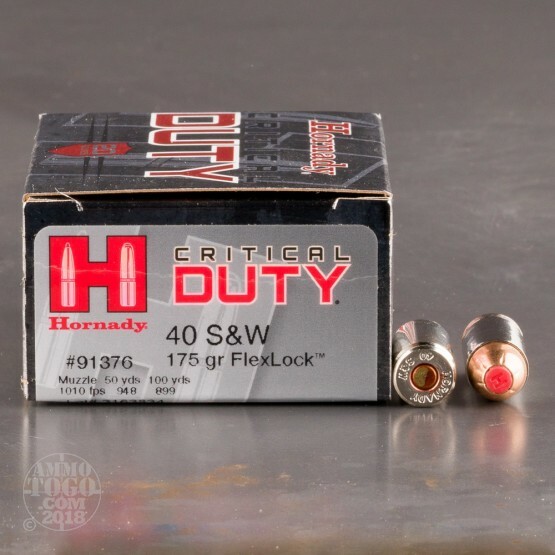 How do the results for this Hornady Ammunition 40 Smith & Wesson compare to other 40 S&W? 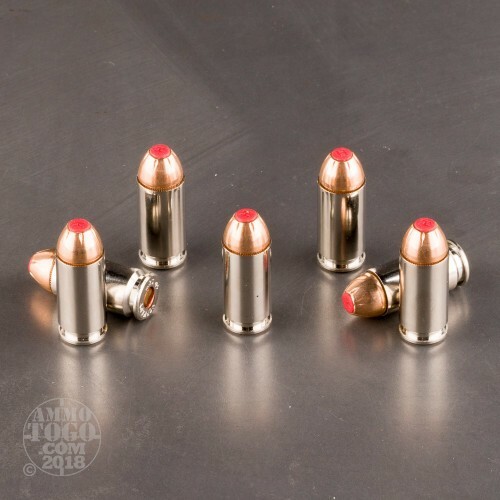 Expansion Diameter Compared to All 40 Smith & Wesson Ammo Tested MIN 0.39" MEDIAN 0.65" THIS AMMO 0.47" U.S. dime MAX 0.89"
Penetration Depth Compared to 40 Smith & Wesson Tested 0" 10" 20" 30" MIN 9.8" MEDIAN 16.5" THIS AMMO 19.3" MAX 32"